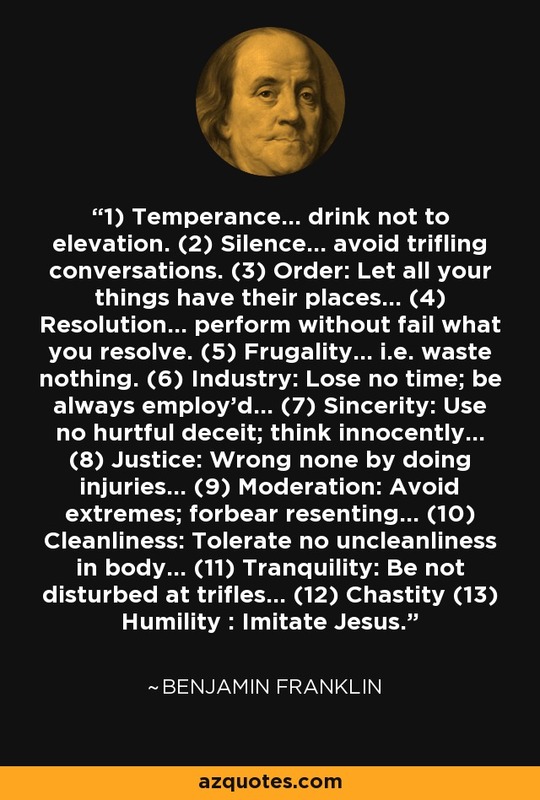 1) Temperance... drink not to elevation. (2) Silence... avoid trifling conversations. (3) Order: Let all your things have their places... (4) Resolution... perform without fail what you resolve. (5) Frugality... i.e. waste nothing. (6) Industry: Lose no time; be always employ'd... (7) Sincerity: Use no hurtful deceit; think innocently... (8) Justice: Wrong none by doing injuries... (9) Moderation: Avoid extremes; forbear resenting... (10) Cleanliness: Tolerate no uncleanliness in body... (11) Tranquility: Be not disturbed at trifles... (12) Chastity (13) Humility : Imitate Jesus.